To cast aluminum and aluminum products, engineers work in aluminum foundries. Foundries are factories that produce metal castings, so, in short, aluminum foundries are aluminum casting factories. Foundries also commonly process cast iron, bronze, brass, steel, magnesium and other metals. Aluminum is cast by melting it into a liquid form, pouring it into a mold and then, after the aluminum cast solidified and cools, removing it from the mold or cast. It may be cast into various shapes and sizes. 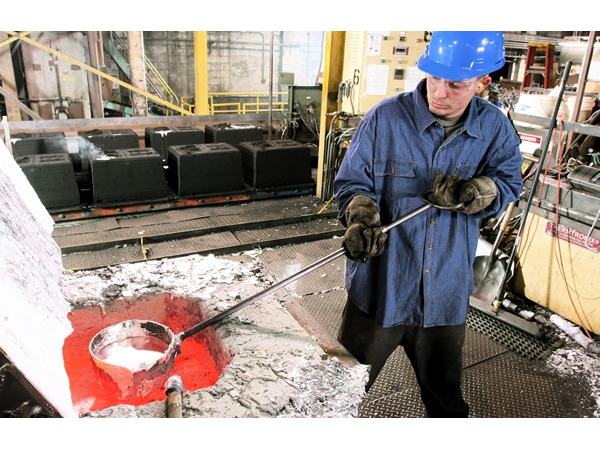 Pouring Aluminum into Sand Cast – Modern Aluminum Castings Co., Inc.
Aluminum foundries use various types of source metal to charge the furnace, including virgin material, external scrap and internal scrap. External scrap is material sourced from other forming processes like punching, forging or machining. Internal scrap consists of risers, gates, defective castings and other extraneous oddments metal produced within the facilities. There are several steps that need to be taken to prepare the material for casting. First the metal used to charge the furnace is melted and refined to remove harmful gases and elements from the molten metal. The chemistry of the molten metal is then adjusted to fit the specifications of the intended final product, and then tapped into a transport vessel. Furnaces are used to melt the charge metal, and depending on the requirements of the manufacturer, a foundry’s furnace attributes, such as size, weight, temperature and heat sources, can all vary to accommodate specific requirements. Aluminum foundries have furnaces specifically designed for aluminum, but can still vary based on the volume of aluminum being cast. Molten Aluminum Handling – Modern Aluminum Castings Co., Inc.
Aluminum foundries most commonly use reverberatory, gas heated crucible or electric resistance furnaces. Sometimes, hydrogen or other gases get into the casting, either by physical entrapment or chemical reaction. If this in the case, it is removed via de-gassing. Aluminum castings are most often formed by die casting, but may also be made via permanent mold casting or sand casting. Casting aluminum presents several advantages. Aluminum is lightweight, retains strength at high temperatures and has high dimensional stability for complex shapes and thin walls, good corrosion resistance, good mechanical properties and high thermal and electrical conductivity. Aluminum castings enjoy widespread usage in the auto industry and in the home. More than half of the aluminum used in cars is made in aluminum foundries and cast aluminum transmission housings and pistons have frequently been used in trucks and cars since the early 1900s. Additionally, components of lawn mowers, hand tools, small appliances and other machinery are produced from shapes cast in aluminum foundries all over the world. At home, you will find the most cast aluminum in your kitchen cabinets. In fact, cookware was the first aluminum product produced for everyday use.